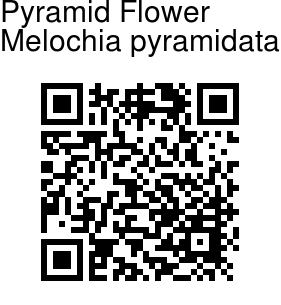 Pyramid Flower is a herb, growing to 1 m tall. It is found mostly in rocky limestone or sandy habitat. Leaves are lanceshaped-ovate, up to 8 cm long. Leaves are almost hairless, with serrated margin. Flowers are purple with a yellow center. They occur in loose, few-flowered cymes. Calyx 2.5–4 mm long, 5 sepals, all sepals joined. 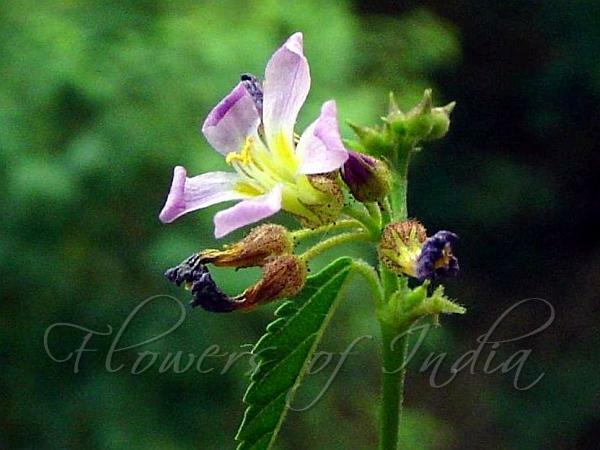 Flower tube 4–8 mm long, 5 petals (persistent), all petals free. Stamens 5, free of the petals, all opposite the petals, coherent to each other (joined at the base). Fruit is 5-angled, about 1 cm long, winged on edges often with purple patches. This species named after the pyramid-like fruit. Flowering: August-October.